Full of character, this pendant is handmade from vintage typewriter keys set in sterling silver. This necklace is a fun, stately accessory for any type of person. 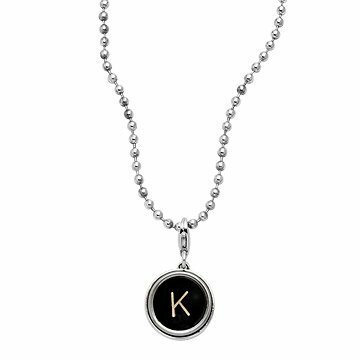 With your choice of vintage typewriter key set in sterling silver on a sterling silver ball chain, the necklace brings back the simple charm of typewriters from days of old. Choose any letter. Handmade in the USA and Mexico from authentic typewriter keys of the 20's, 30's and 40's. chain: 18" L, pendant: .5"
The recipient loved the necklace. It was a perfect thank-you gift for her. This necklace was absolutely our granddaughter's "type"! This was a Christmas gift for our granddaughter. We bought it for its uniqueness and because I actually am old enough to have used manual typewriters. We were also pretty sure no one else would have one. She loved it. I previously gave this necklace 5 stars. Sadly, after gifting this great necklace to my sister, I have to revise my review down to 3 stars. The chain, which is lovely, and which I love, doesn't permit the necklace to hang straight and keeps getting all catawampus and veering off to one side. My sister finally had to switch to a different chain so she wasn't forever adjusting. I'm very sad about this. It's a shame. I will still recommend this. Maybe it will hang straight on others. For the readers/old school typists in your life! This is the second such necklace I have purchased. I got this as a gift for my sister when I visit. We both took typing in school when actual typewriters were used, and were very good! She was the better typist, and I am hoping this will remind her and bring back fond memories. The first one I purchased was for my daughter-in-law, who is the managing editor for a major newspaper. Of course she could relate! Very unique and nice piece of jewelry. Recipient LOVES it! Wonderful Gift for your reader friends! This was a gift to my book-loving niece who also loves to write! She just loved it and raved about it to the whole family. Received pendant on time in a lovely box. Will wear it alot. As mentioned, will purchase longer necklace so will have choice of length and it can be worn with any type of blouse or top. Really brought back good memories. In my day learning to type on a manual was a real accomplishment. Thanks Uncommongoods. Aspiring Writer Teenaged Niece Loves It! I was searching for something to inspire/encourage/help my teenaged niece who is currently writing her own book. She is typically difficult to buy for - as with all teens and not particularly girly but as I searched for actual practical writer's gifts, I came across this and I thought she could wear it as a reminder that she IS a writer even during the times when she might doubt herself and her craft. Happy to report that she seems to love it! I bought as a gift for a friend. I was excited to give it to her. I loved the chain and how strong the clasp was that hooked the letter to chain. It is such a unique piece of jewlwery. Excellent product, shipped on time and very good packaging for gift giving.